Hatteland Display has signed a long term agreement with an approx EUR 1/2 million annual value to provide its recently upgraded Series 1 Maritime Multi Display (MMD) for use in Hernis Scan Systems' sophisticated marine CCTV Systems. The leading marine surveillance company chose Hatteland Display's Series 1 as a direct result of the improvements that the company made during an extensive redesign of the system and re-introduction to the market in June 2007. "We opted for the new Series 1 based on the numerous improvements Hatteland Display introduced for the redesigned version," comments Dag Utskot, Factory Manager Hernis Scan Systems. "Our CCTV systems are installed on vessels that operate in the most extreme environments so we have to provide monitors that are flexible and highly reliable. We believe the upgraded Series 1 family has those strengths and are confident that they will perform well for our customers." The new Series 1 follows the same form fit as its near industry standard predecessor, enabling simple upgrading and integration to existing systems, but now using fewer modules and cable connections, which increases reliability and reduces component costs. 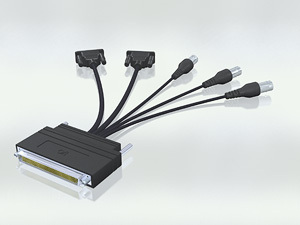 In addition to being able to offer more value, Series 1 MMDs also feature improved connectivity and functionality. S-VHS Video Input and Serial Communcation. Hatteland Display can now offer more signal input/outputs upon request for customized solutions. Hatteland Display has also integrated an Embedded Video Controller X-tended, enabling users to utilise more signals than before. Other connections include RGB out, RGB in, IEC outlet, 2 x COM ports and USB. "The Series 1 redesign has been a huge success and we are delighted to have the opportunity to supply Hernis Scan Systems with the best solution at the right price," says Mrs. Torhild Ø. Skrunes, Sales Representative, Hatteland Display AS. "Series 1 has for a long time been a market leader and with the reception to the upgrades so far, this position looks set to become even stronger."